The Graduate Field of Psychology includes 39 faculty members from departments across the university including Psychology, Human Development, and Neurobiology and Behavior. Only Ph.D. candidates are admitted. The goal of the Field is to educate students to become researchers, scholars, and teachers who will contribute to the future of psychology as a scientific discipline in academic or other research-oriented settings. 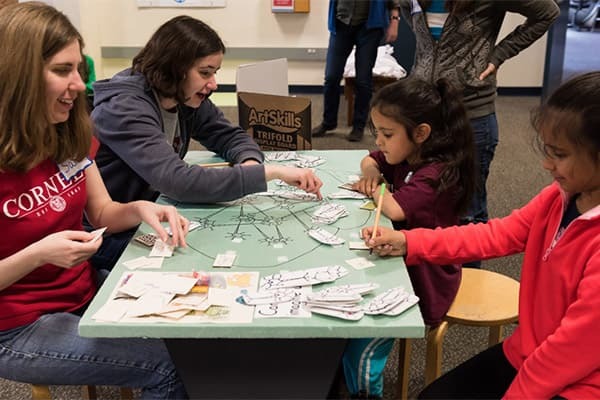 Graduate Course Spotlight: Psychology at the Sciencenter! When the 11 graduate students in PSYCH 4500, Psychology at the Sciencenter!, first walked into their classroom, instead of chairs they found a “maker” space: walls lined with shelves of crafts supplies like glue, string, foam board, nails, marbles, and the ever-versatile duct tape. Their first assignment: create a science demo based on a simple description. Click here to read more about our students' experiences with hands-on science communicataion.